If you're looking to put in new flooring, you might consider bamboo. With its cool, Zen appearance, bamboo is a chic, modern option for residential flooring. Although it's designed to mimic a number of woods, from oak and maple to exotics like mahogany, bamboo actually isn't a wood at all, but a grass. When bamboo flooring first became popular as an eco-friendly product some 20 years ago (commercial production only began in the 1990s), demand for it flooded the market with inferior product that warped, cupped, and swelled. But since then, producers have begun to self-correct, introducing engineered strand or strand-woven flooring with enhanced performance. Vertical-grain flooring consists of strips placed on edge and glued together, much like a butcher block. For flat-grain flooring, strips are stacked one atop another like a sandwich and glued. The bamboo for strand-woven flooring is highly processed: narrow strands get soaked in glue, placed in a mold to form a beam approximately the size of a railroad tie, and are then dried under intense pressure, baked, and cured. The beams are then milled into planks, after which they are finished with a variety of fillers, sealants, and coatings. Due to this process, engineered bamboo flooring is stronger than the other types, yet it's not necessarily more expensive. 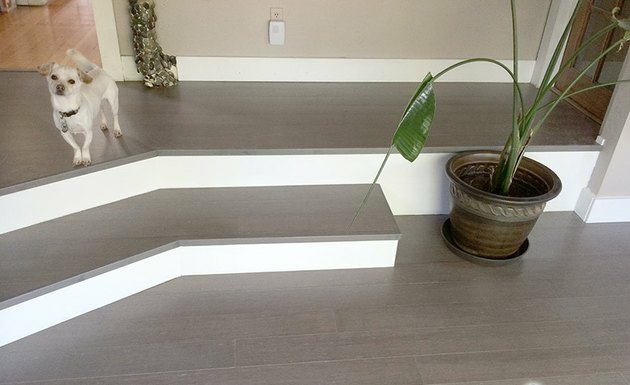 Bamboo flooring has a cool, Zen aesthetic. You wouldn't think something as innocuous as bamboo could make waves, but it does. Manufacturers and sellers loudly tout bamboo as an environmentally friendly product, but critics argue that hardwood forests have been leveled to make way for bamboo plantations. They also bash bamboo flooring as requiring high levels of energy to process and produce as compared with hardwood, and they cite the harmful chemicals used in its manufacture. There are many reasons bamboo is a popular flooring choice. Strength and hardness: Bamboo fibers have a tensile strength close to that of steel. The Janka rating—a measure of wood's resistance to denting and wear—of strand-woven bamboo flooring comes in at 3,000, which is stronger than oak. Renewability: Moso bamboo grows at a ridiculously fast rate, anywhere from one to three feet per day. It matures within five to seven years and can be harvested without killing the plant. It's also CO2 neutral in its carbon dioxide absorption and oxygen release. However, see The Controversy over Bamboo Flooring, above—it's not easy being green. Cost: Bamboo flooring is less expensive than hardwood—up to 50% cheaper. Options: Bamboo flooring comes in an abundance of finishes, usually with subtle grain patterns. You'll find a range of plank widths, from 3 to 5 1/2 inches or more, in different lengths. Bamboo flooring sometimes mimics exotic hardwoods. Even though technology has vastly improved bamboo flooring, it still comes with some issues. Quality: Much of the industry is based in China, which has little regulation. This makes it hard to gauge manufacturers' claims and know whether you're buying a good, responsibly produced product. Don't get bamboozled: buy from a company you trust. Not sure? Check out the warranty—the best flooring comes with the longest warranties. Instability: Bamboo flooring fades or lightens with prolonged exposure to intense sunlight. And inferior bamboo flooring may cup, warp, or swell because it's very sensitive to moisture. This is especially true of products made from immature or improperly dried bamboo. So look for products from reputable manufacturers. Toxicity: Bamboo flooring has a high glue content, and some manufacturers use toxic urea-formaldehyde adhesives and finished to produce their flooring. These will off-gas, so be careful what you buy. Look for products that have been third-party certified (by FloorScore or GREENGUARD, for example). Sanding and refinishing is a crapshoot: You can sand and refinish bamboo flooring that was glued to a subfloor, but because of variations in density, it's impossible to predict how many times this is possible. Soft bamboo, floating flooring, and flooring installed on a foam underlay cannot be refinished. Sensitivity: Compressed strand bamboo generally resists dents and is more durable than most timbers. However, without utmost care, bamboo floors will accrue scuff marks and scratches over time, so limits its exposure to heels, claws, and grit. It's persnickety: Bamboo flooring does best installed in a home that retains a consistent temperature of 65 to 75°F and a relative humidity of 40 to 55%. You must let your flooring acclimate before installing it or it will shift and shrink, leaving gaps. This requires nothing more than removing any plastic from the flooring and letting it sit in the room for 7 to 10 days to let the moisture stabilize. Because strand bamboo is especially dense, acclimation may take longer—up to a month. Make sure your subflooring is level and dry. Floating installation requires a moisture barrier underlayment. Bamboo flooring comes in an abundance of finishes, usually with subtle grain patterns.